Tenshi Neko Kawaii Strawberry Princess Bag , Small Handbags , Bags : Starscastle Online Shop: Cute Bags, Accessories, Kawaii Stationery, Cool Wallets, Fashion Jewelry & More! 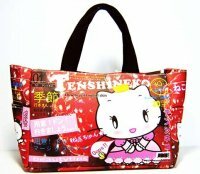 Super cute design with strawberry princess Tenshi Neko image on front and back. Small bag with a cute Tenshi Neko charm zip and handle. 2 external side pockets perfect for putting your mobile phone or MP3 player. 1 inner pocket with zip. Inner bag fully lined.